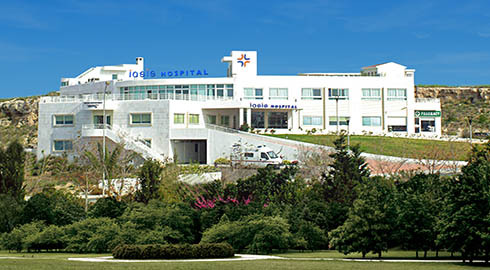 IASIS HOSPITAL, owned by the Leptos Group, is an established Private Hospital, considered to be amongst the best equipped and staffed hospitals in Cyprus.The Hospital offers a wide range of medical treatments, diagnostic tests and auxiliary services. Highly trained and experienced medical doctors are always ready to provide their services, both in the Outpatients and Inpatients Department. Amongst other features, the Hospital has a capacity of 36 beds, three operating theatres, delivery rooms, Biochemical and Heamatological laboratories and a Radiology Department. The Hospital's mission is to provide the best medical care in a pleasant and comfortable environment. Great emphasis has been given to create an aesthetically pleasing environment. High quality medical treatment is offered by qualified doctors experienced and trained on the latest high technology equipment. The doctors are on a 24-hour alert system and the casualty department is always prepared to handle any medical occasion. The hospital's construction was based on the latest architectural and strictest health safety standards in order to be functional, comfortable and safe. All the hospital rooms are equipped with private facilities and all-access communication consoles for nursecalling, telephone, satellite television, free wi-fi and air-conditioning facilities. Luxury, private and semi - private rooms. Wide range of medical and surgical specialities.